This is a long overdue post. I've had my Lagu beach blanket for quite sometime now but I never really had the opportunity to try it out until last weekend. So, what's the verdict? Should or should you not Lagu? The answer is a big YES! Yes, you should Lagu before attempting to hit the beach this summer. First of all, it's beach/eco-friendly. Did you know that the little sand we carry back home with us after beach vacations commulatively do great damage to our shorelines? Besides, it's annoying and a big hassle to clean up. Lagu repels sand, dries quickly, stores neatly and is very lightweight. I put it under a stress-test with a very hairy, wet and sand infested shih tzu. It passed with flying colors compared to the traditional plastic banig that we also had with us. Unlike the banig that tends to heat up after a few minutes under the glaring sun, my Lagu stayed cool and sand was very easy to shake off despite being a little damp from Chewy (my dog) hanging out on it all afternoon. So yes, yes, yes. 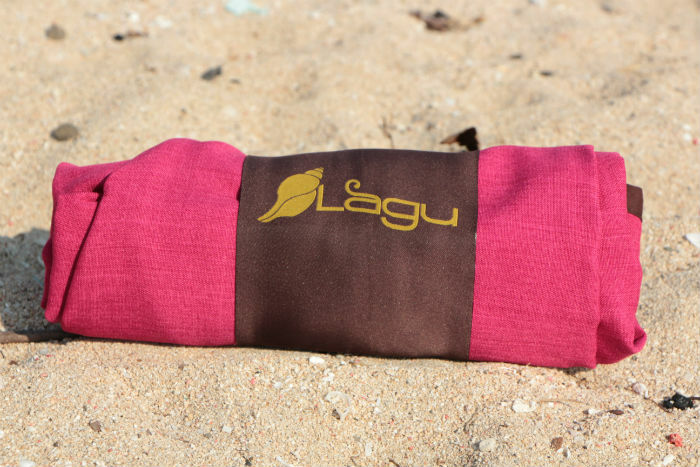 Do yourself and the beach a favor and get yourself a Lagu beach blanket.